Calgary Relocation | What do YOU need to Know? Calgary relocation - What for? Find more about Calgary before you get here. ...Have you ever thought about moving? You know, just packing up your things and moving. Lock, stock and 2.2 kids. You must have, everyone does at some point in time or other. The difference between them and you is that you're here, reading this article, and that probably means you might even be thinking about a move to Calgary soon, since this page is, after all, about Calgary. There's also a great probability that you never thought that such a move was in the cards for you. Maybe it's not a voluntary displacement. You know, the old job needs your services in Calgary and no one else will do. But don't worry, you're not moving to the edge of beyond out on some dusty old map, despite what you may think. The opportunity of a Calgary relocation is certainly a unique one as you’ll not find another place like it. Ok, so where am I going? A young and dynamic city, Calgary is as interesting a place as Sydney, or Los Angeles, and is not only situated on the banks of the Bow, and the Elbow River, but is also close to Alberta's Rocky Mountain range. Dazzling, breathtaking snow capped mountains at your doorstep throughout the year. Anybody moving to Canada ought to see this. Technically when you relocate, although you’ll be a resident of Calgary, you’ll actually still be as wet behind the ears as any first time tourist would. Yippee, this gives you an advantage over all the other home grown citizens you share Calgary with. You get the bona-fide, once in a lifetime opportunity to explore Calgary like the tourist that you are. For the next few months anyway, then you’re just a normal resident in this wonderful city! The only drawback is that you don't actually want to look like a tourist, afraid that your colleagues will see you dressed up in all your touristy gear! But don't throw any of it away. You're more than likely to need it again soon, just as July rolls around, because, come mid-July one of the biggest events in Calgary will ride on into town, and you won't want to miss any part of this ten day event. What am I talking about, you ask? The Calgary Stampede of course! Ten days when downtown Calgary actually looks like something out of a Louis L'Amour book - cowboys, rodeo, and even chuckwagon races! An event not to be missed. And nightlife galore. 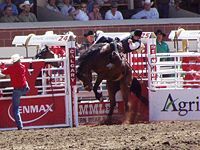 The Stampede's not the only attraction about Calgary however, there's more for you to enjoy and see. After all, it's in Canada. Located in the heart of the city center, and built in 1968, the Calgary Tower is an impressive structure. Then we have the Eau Claire Market which is a diverse mix of mall and IMAX theatre with a craft market thrown in. Oh, did I forget to mention the plus-15's? Elevated enclosed walkways linking the market stores, that start at a height of 15 feet above street level. An entire web of activity connecting all parts of the heart. So what do you think of your Relocation Calgary now? Getting a little more excited? If your friends start heckling you about your relocation and telling you that it's the back of neverland then just smile nicely. After all, you know you are the one relocating to this city and pretty soon they'll be the ones asking to visit - or maybe even look for a Calgary relocation of their own. Navigate back from Calgary Relocation to Calgary Houses for Sale from this page now.